Ooh this was a fun one! Back in February when I heard of my impending uncle-dom, I began working on a garter stitch square with the intention of turning it into a baby blanket/shawl for the little one. I never tire of a good garter stitch square trimmed with a lacy edge - I think they're simple, elegant and wonderful to knit. They never do you wrong. Ever. At the same time the garter stitch knitting was happening (academic de-tox) I was amassing a stack of Shetland Knitting History Books (pleasure reading) on the bedside table. Being exposed to pages and pages of the most unbelievable Shetland lace, the beautiful Hap Shawls put a spell on me (I think I'll make an 'official' one this year) and, when it came time for choosing a suitable edge to incorporate my second-color, Feather-and-Fan struck back with a vengeance! The nice folks over at KnitPicks sent me some of their new City Tweed yarn to play with. 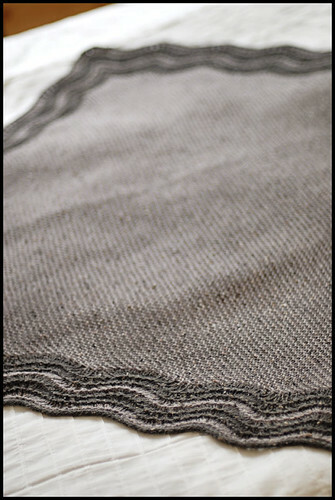 It's super soft and allowed me to create a shawl that's baby-skin-friendly while masquerading as something a bit more rustic (rustique?). I knit the (DK-weight) yarn up on an 8 and blocked the piece as for lace with blocking wires and a nice drumskin tension. I love how it came out - the softness and squishiness remains but with a drapey, shawl-like quality. The garter stitch is worked on the bias, starting with one stitch and increasing one stitch on each row to create the square - at the halfway point, just replace a decrease for your increase and you end up shaping it back down to one stitch. Then it was just a matter of picking up stitches and Feather and Fanning myself into oblivion. I finished off with an applied I-Cord to keep simple, felxible edge and of course adhere to the 'no-hard-bind-offs' rule of lace blocking. It's a bit early for October, but I guess it just means we'll have more woolens to chat about between now and then. Is there anything better than knitting for a Fall arrival? I love it! ... as usual. Stunning! I don't know how you always manage to make lace knitting and baby knitting seem masculine and so sweet/adorable all at the same time. I'm currently getting ready to cast on for a Girasol for a close friends wedding gift. Thanks for all the inspiration. This is lovely. I used to knit a lot but don't get so much time to do so now (3 young children to look after). I actually have a baby shawl half finished of a similar style that I started whilst having my middle child who's now 3 1/2. The shame! Anyway, I love your work and enjoy your blog a lot. There is something so old-fashioned and lovely about this, as though you'd find it in an antique crib. Love it, and I'm not a fan of garter stitch! You've sold me on that yarn! What a lucky baby. So elegant. are you going to release as a pattern?? Wow - that's BEAUTIFUL!!!! I didn't know that Knit Picks is carrying tweed - I'm definitely going to try it! Beautiful! I love the simple greys...almost like it's straight from a black and white movie. It matches the simplicity of the stitches you chose perfectly. Sweet Jesus -- that's GORGEOUS! At the risk of being repetitive with an earlier commentor - it is simply beautiful. Thanks for sharing and for the inspiration. I just recceived these exact 2 colors of city tweed! 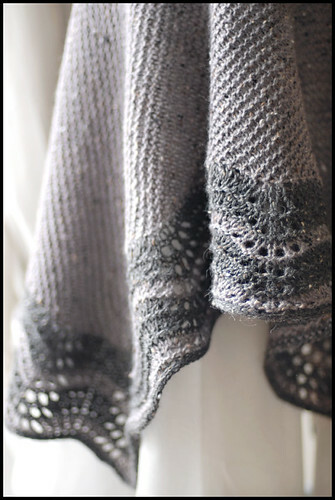 just absolutely gorgeous knitting and pattern ! Gorgeous! What a great baby blanket. Your work and images never cease to amaze and inspire. oh, how lovely + dreamy! i've got a hap blanket pattern from ysolda's whimsical little knits book that i've been considering; yours just convinced me to move it up in the queue! What a great idea! Nice when simple things work out so well. Pure luxury for the little one I believe. Wonderfully made. Wow, that's beautiful. I'm thinking my due-in-September baby might need one very much like it. I have a question if you don't mind. I've not done much lace and certainly never an edging on something square, did you have to do anything to make the corners square like you did, it looks as though you lined it up some specific way to keep your "corners" amongst the F&F. 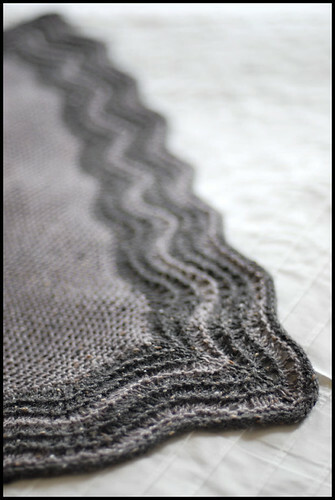 I already admired this on Flickr but have to say again...what a beautiful result with your shawl! I was born in Shetland and swaddled in a Hap shawl myself. I think it is such a special gift for a newborn.I assume you were reading Sharon Miller's book? Some amazing photos in there! You can never be too early when knitting for a baby and you are off to an amazing start. The blanket is sweet without being "fussy" and the lace trim is perfect. Genius!!! Exquisite!! Will you write a pattern? How did you get your hands on City Tweed in February? Perfect in its simplicity. A cherished heirloom for sure! Gorgeous! I have 3 friends due with first babies in the fall, and this looks perfect. How many balls of the City Tweed did it take? what a fabulous uncle to have...this is simply lovely, a beautiful drape and a beautiful colour..lovely..
being pregnant with a fall arrival, I'd like to say NO. There is nothing better than knitting for one. Of course, that would require me to finish up the baby projects I started. That is just so sweet and so neat! I expect to see many of those blankies on Ravelry, lol! I have just about plucked up enough courage to attempt the HEMLOCK RING BLANKET for my DH for our anniversary and I have found that the links in your post on the blanket and also the ravelry links to the your chart is giving an error message. I am not experienced enough to do it without a chart. please help! The simplest things are often the most beautiful. Lovely! I love garter stitch for its meditative and relaxing knitting and for its pure and simple elegance. That you've teamed it with feather and fan and subtle shades of the same neutral is just mind bogglingly beautiful. You have a way with yarn! I assume you had to block the feather-and-fan to accentuate the wave? Just lovely! 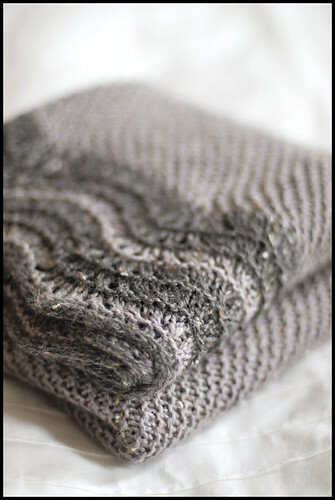 Thank you for another reminder of the simple beauty of garter stitch. And how smart of KnitPicks to send that yarn to the King of Tweed! You do have a way to take simple ingredients and make something so lovely and elegant. What a lucky baby to receive this. That is a wonderful baby blanket! And the new CIty Tweed is great, isn't it? Luxurious and rustic at the same time - and is some really appealing colors. 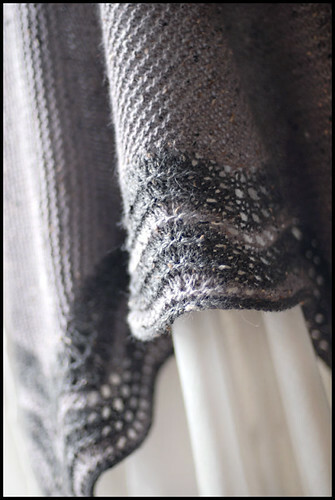 I test knit the Nona's Garden shawl out of it for them and loved working with it. Thanks for sharing the blanket with us! VERY nice! I'm always on the lookout for a different baby blanket idea. I'll be putting this one to good use. Nothing better. You'd think they timed it right for the wonderful knitting uncle! Correct me if I'm wrong, but did you knit the square more as a diamond? Starting with a few stitches, increasing until you reached the middle, then decreasing to the other side? The garter looks to be at an angle rather than "straight on". Am I seeing the pattern correctly? I haven't yet attempted a feather & fan item, but love the stitch. I now know what I will be using it on, this blanket is simply beautiful. What a lucky baby to have you knitting for them. That is just heavenly. Wonderful work and beautiful photos. That is stunning. Any baby would be proud to be wrapped in that. I have a couple of questions for you--How many balls of Tweed did you use for each color? How many stitches did you have on your longest row? gorgeous! although i will admit to being mightily intimadated re: blocking, lace, & i-cord!! Colors are serene and beautiful. Garter stitch is classicly simple, very nice. Doh! The 'no-hard-bind-offs' rule of lace blocking, indeed. This is a rule I will follow forevermore. I made a shawl based in part on Evelyn Clark's Shetland Triangle pattern that breaks this rule and even though it seemingly behaved during blocking (after I ripped out the first binding and did it again with several-sizes-larger needles), it curls up at the edge when I wear it and makes me crazy. Guess I'd better start studying the shetland lace books, as you've been doing! Stunning, I absolutely love it. Are the corners mitered? That's gorgeous, and looks so much more fun to make than the baby blanket I've been working on for one of my MIL's friends even though they are both mostly garter stitch! So fabulous! And thanks for the critique of City Tweed. I've been wanting to order some and now I will. Everything about this says "gentle" me - the color combination, the beautiful edge. Perfect for a baby! Aboslutely incredible! I shall join the chorus clammering for this pattern. The middle, easy enough. The lace, not so much, need guidance! So beautiful...love the pattern but I am more impressed by your color choices. I would never thought those colors for baby blankets. I am new here and I am not familiar with your blog so I would like to ask. Are you publishing the pattern? Your blankets are just lovely, every time you make one I'm suddenly inspired to do one of my own. This is gorgeous, and I can see it being a perfect lap-blanket for spring and fall, as well. Beautiful, simple, elegant. It's lovely! I take it back and apologize; somehow I must have skipped over the part about you ..... knitting it on a bias.... haha! Please, please write up the pattern! Love the rustique style/coloured edges! lovely. And yes, how do you turn the corners with the feather and fan pattern? I have 2 (at least) babies to knit for and would like to make one too. Absolutely beautiful. I really hope you make the pattern available. gorgeous! 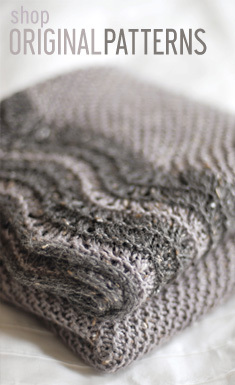 and thanks for the review of knitpicks, i love hearing about new yarns i havent tried yet! I'm sorry... I was talking to the blanket. Privacy, please. Gorgeous! I have the perfect little one in mind for one. Also, just ordered a certain book from our Classic Elite rep last week...can't wait to see it in the shop !!!!!!!!! Could we talk you into writing up the pattern - at least for the feather and fan border? The blanket is just right, and I love it. Did you just pick-up and knit the feather and fan pattern around the edge? Oh, come on, you have to tell us! I'm glad to know you liked the City Tweed. I was wondering about it. This is gorgeous. .... Excellent choice of color and yarn! I love this & want to make it for my baby boy! Will you be posting or making a pattern to sell? I would love to have it! that is amazingly elegant and beautiful! The feather and fan border is a stroke of genius! Lucky baby! Yet another fan (pardon the pun) wanting details on how this one was done. How many balls of yarn did you use? And please, the pattern on the edging, you must share. Beautiful. Love, love, love your blog. As always, your work is beautiful, simple and texture-wonderful. It's lovely. I have the kp dk ct and just swatched some yesterday, it's wonderful stuff. I love feather and fan. In fact, I did the opposite of your blanket--a feather and fan blanket with garter edging. I love the feather and fan just as an edge. It's very sweet. I love how this blanket is both modern and vintage looking. Very nice! That is incredible--it even looks soft and drapey in the photos! Great idea! 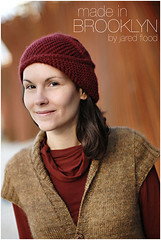 Feather and fan is one of my favorite GO To- stitch patterns and you've given it a fresh spin! Lovely! Pattern, please please please! Loved the idea of the bias garter! How does one do the mitered corners in the feather and fan? A simply gorgeous baby blanket. I love this!! The colors are wonderful. Is there a pattern yet? The baby blanket it lovely! lovely! this yarn is a must-try. What a wonderful masculine interpretation of Shetland Lace - I think your 'designer's eye' has it just right, the colour and yarn combination works extremely well. The solid I-cord edging is a great idea that should add bulk and body. I know this question has been asked, numerous times, but I can't seem to find the answer--are you planning on writing up a pattern for this most simply elegant baby blanket. I tried, but was unsuccessful in following the casual directions you offered us. I'm the kind of knitter that requires a pattern to keep things going correctly--a bit on the dyslexic side I guess.
! i love some recommendations for reading up on knitting and the hisory of and anything related. i am very interested in reading the stories that inspired this piece! Oh what a tease you are to not give us a pattern for that border! Knit tease! Knit tease! Oh Master, have mercy on those of us who aren't as skilled as you! So beautiful and elegant...that is what I love about crochet.It makes a simple thing so delicate.I love to take out snippets of time from here and there to knit....makes me unwind my worries a lot.